These highlights do not include all the information needed to use DIGOXIN TABLETS safely and effectively. See full prescribing information for DIGOXIN TABLETS. Treatment of mild to moderate heart failure in adults (1.1). Increasing myocardial contractility in pediatric patients with heart failure (1.2). Control of resting ventricular rate in patients with chronic atrial fibrillation in adults (1.3). Digoxin dose is based on patient-specific factors (age, lean body weight, renal function, etc.). See full prescribing information. Monitor for toxicity and therapeutic effect (2). Tablets: 125 microgram and 250 microgram scored (3). Known hypersensitivity to digoxin or other forms of digitalis (4). Risk of rapid ventricular response leading to ventricular fibrillation in patients with AV accessory pathway (5.1). Risk of advanced or complete heart block in patients with sinus node disease and AV block. (5.2). Digoxin toxicity: Indicated by nausea, vomiting, visual disturbances, and cardiac arrhythmias. Advanced age, low body weight, impaired renal function and electrolyte abnormalities predispose to toxicity. (5.3). Risk of ventricular arrhythmias during electrical cardioversion (5.4). Not recommended in patients with acute myocardial infarction (5.5). The overall incidence of adverse reactions with digoxin has been reported as 5 to 20%, with 15 to 20% of adverse events considered serious. Cardiac toxicity accounts for about one-half, gastrointestinal disturbances for about one-fourth, and CNS and other toxicity for about one-fourth of these adverse events (6.1). To report SUSPECTED ADVERSE REACTIONS, contact Sun Pharmaceutical Industries, Inc. at 1-800-406-7984 or FDA at 1-800-FDA-1088 or www.fda.gov/medwatch. PGP Inducers/Inhibitors: Drugs that induce or inhibit PGP have the potential to alter digoxin pharmacokinetics (7.1). The potential for drug-drug interactions must be considered prior to and during drug therapy. See full prescribing information (7.2, 7.3, 12.3). Pregnant patients: It is unknown whether use during pregnancy can cause fetal harm (8.1). Pediatric patients: Newborn infants display variability in tolerance to digoxin (8.4). Geriatric patients: Consider renal function in dosage selection, and carefully monitor for side effects (8.5). Renal impairment: Digoxin is excreted by the kidneys. Consider renal function during dosage selection (8.6). Digoxin is indicated for the treatment of mild to moderate heart failure in adults. Digoxin increases left ventricular ejection fraction and improves heart failure symptoms as evidenced by improved exercise capacity and decreased heart failure-related hospitalizations and emergency care, while having no effect on mortality. Where possible, digoxin should be used in combination with a diuretic and an angiotensin-converting enzyme (ACE) inhibitor. Digoxin increases myocardial contractility in pediatric patients with heart failure. Digoxin is indicated for the control of ventricular response rate in adult patients with chronic atrial fibrillation. In selecting a digoxin dosing regimen, it is important to consider factors that affect digoxin blood levels (e.g., body weight, age, renal function, concomitant drugs) since toxic levels of digoxin are only slightly higher than therapeutic levels. Dosing can be either initiated with a loading dose followed by maintenance dosing if rapid titration is desired or initiated with maintenance dosing without a loading dose. Consider interruption or reduction in digoxin dose prior to electrical cardioversion [see Warnings and Precautions (5.4)]. Use digoxin solution to obtain the appropriate dose in infants, young pediatric patients, or patients with very low body weight. For adults and pediatric patients if a loading dosage is to be given, administer half the total loading dose initially, then ¼ the loading dose every 6 to 8 hours twice, with careful assessment of clinical response and toxicity before each dose. The recommended loading dose is displayed in Table 1. The recommended starting maintenance dose in adults and pediatric patients over 10 years old with normal renal function is given in Table 2. Doses may be increased every 2 weeks according to clinical response, serum drug levels, and toxicity. Reduce the dose of digoxin in patients whose lean weight is an abnormally small fraction of their total body mass because of obesity or edema. a Doses are rounded to the nearest dose possible using whole digoxin tablets. Recommended doses approximately 30 percent lower than the calculated dose are designated with an *. Monitor digoxin levels in patients receiving these initial doses and increase dose if needed. b For adults, creatinine clearance was corrected to 70-kg body weight or 1.73 m2 body surface area. If only serum creatinine concentrations (Scr) are available, a corrected Ccr may be estimated in men as (140 – Age)/Scr. For women, this result should be multiplied by 0.85.
d The doses listed assume average body composition. The starting maintenance dose for heart failure in pediatric patients less than 10 years old is based on lean body weight, renal function, age, and concomitant products [see Clinical Pharmacology (12.3)]. The recommended starting maintenance dose for pediatric patients between 5 years and 10 years old is given in Table 4. These recommendations assume the presence of normal renal function. Table 5 provides average daily maintenance dose requirements for pediatric patients between 5 and 10 years old (to be given twice daily) with heart failure based on age, lean body weight, and renal function. b The doses are rounded to the nearest dose possible using whole and/or half digoxin tablets. Recommended doses approximately 30 percent lower than the calculated dose are designated with an *. Monitor digoxin levels in patients receiving these initial doses and increase dose if needed. c The modified Schwartz equation may be used to estimate creatinine clearance. See footnote b under Table 3.
d If no loading dose administered. Interpret the serum digoxin concentration in the overall clinical context, and do not use an isolated measurement of serum digoxin concentration as the basis for increasing or decreasing the digoxin dose. Serum digoxin concentrations may be falsely elevated by endogenous digoxin-like substances [see Drug Interactions (7.4)]. If the assay is sensitive to these substances, consider obtaining a baseline digoxin level before starting digoxin and correct post-treatment values by the reported baseline level. Obtain serum digoxin concentrations just before the next scheduled digoxin dose or at least 6 hours after the last dose. The digoxin concentration is likely to be 10% to 25% lower when sampled right before the next dose (24 hours after dosing) compared to sampling 8 hours after dosing (using once-daily dosing). However, there will be only minor differences in digoxin concentrations using twice daily dosing whether sampling is done at 8 or 12 hours after a dose. Tablets, USP: 125 micrograms (0.125 mg) are round, biconvex, yellow tablets, debossed with "437" on one side and scored on other side. Tablets, USP: 250 micrograms (0.25 mg) are round, biconvex, white tablets, debossed with "441" on one side and scored on other side. Ventricular fibrillation [see Warnings and Precautions (5.1)]. Digoxin may cause severe sinus bradycardia or sinoatrial block particularly in patients with pre-existing sinus node disease and may cause advanced or complete heart block in patients with pre-existing incomplete AV block. Consider insertion of a pacemaker before treatment with digoxin. Signs and symptoms of digoxin toxicity include anorexia, nausea, vomiting, visual changes and cardiac arrhythmias [first-degree, second-degree (Wenckebach), or third-degree heart block (including asystole); atrial tachycardia with block; AV dissociation; accelerated junctional (nodal) rhythm; unifocal or multiform ventricular premature contractions (especially bigeminy or trigeminy); ventricular tachycardia; and ventricular fibrillation]. Toxicity is usually associated with digoxin levels greater than 2ng/ml although symptoms may also occur at lower levels. Low body weight, advanced age or impaired renal function, hypokalemia, hypercalcemia, or hypomagnesemia may predispose to digoxin toxicity. Obtain serum digoxin levels in patients with signs or symptoms of digoxin therapy and interrupt or adjust dose if necessary [see Adverse Reactions (6)and Overdosage (10)]. Assess serum electrolytes and renal function periodically. Given that adult patients with heart failure have some symptoms in common with digoxin toxicity, it may be difficult to distinguish digoxin toxicity from heart failure. Misidentification of their etiology might lead the clinician to continue or increase digoxin dosing, when dosing should actually be suspended. When the etiology of these signs and symptoms is not clear, measure serum digoxin levels. It may be desirable to reduce the dose of or discontinue digoxin for 1 to 2 days prior to electrical cardioversion of atrial fibrillation to avoid the induction of ventricular arrhythmias, but physicians must consider the consequences of increasing the ventricular response if digoxin is decreased or withdrawn. If digitalis toxicity is suspected, elective cardioversion should be delayed. If it is not prudent to delay cardioversion, the lowest possible energy level should be selected to avoid provoking ventricular arrhythmias. Digoxin is not recommended in patients with acute myocardial infarction because digoxin may increase myocardial oxygen demand and lead to ischemia. Digoxin can precipitate vasoconstriction and may promote production of pro-inflammatory cytokines; therefore, avoid use in patients with myocarditis. Patients with heart failure associated with preserved left ventricular ejection fraction may experience decreased cardiac output with use of digoxin. Such disorders include restrictive cardiomyopathy, constrictive pericarditis, amyloid heart disease, and acute cor pulmonale. Patients with idiopathic hypertrophic subaortic stenosis may have worsening of the outflow obstruction due to the inotropic effects of digoxin. Patients with amyloid heart disease may be more susceptible to digoxin toxicity at therapeutic levels because of an increased binding of digoxin to extracellular amyloid fibrils. Digoxin should generally be avoided in these patients, although it has been used for ventricular rate control in the subgroup of patients with atrial fibrillation. Hypothyroidism may reduce the requirements for digoxin. Heart failure and/or atrial arrhythmias resulting from hypermetabolic or hyperdynamic states (e.g., hyperthyroidism, hypoxia, or arteriovenous shunt) are best treated by addressing the underlying condition. Atrial arrhythmias associated with hypermetabolic states are particularly resistant to digoxin treatment. Patients with beri beri heart disease may fail to respond adequately to digoxin if the underlying thiamine deficiency is not treated concomitantly. In general, the adverse reactions of digoxin are dose-dependent and occur at doses higher than those needed to achieve a therapeutic effect. Hence, adverse reactions are less common when digoxin is used within the recommended dose range, is maintained within the therapeutic serum concentration range, and when there is careful attention to concurrent medications and conditions. In the DIG trial (a trial investigating the effect of digoxin on mortality and morbidity in patients with heart failure), the incidence of hospitalization for suspected digoxin toxicity was 2% in patients taking digoxin compared to 0.9% in patients taking placebo [see Clinical Studies (14.1)]. The overall incidence of adverse reactions with digoxin has been reported as 5 to 20%, with 15 to 20% of adverse events considered serious. Cardiac toxicity accounts for about one-half, gastrointestinal disturbances for about one-fourth, and CNS and other toxicity for about one-fourth of these adverse events. Digoxin is a substrate of P-glycoprotein, at the level of intestinal absorption, renal tubular section and biliary-intestinal secretion. Therefore, drugs that induce/inhibit P-glycoprotein have the potential to alter digoxin pharmacokinetics. Measure serum digoxin concentrations before initiating concomitant drugs. Reduce digoxin concentrations by decreasing dose by approximately 30% - 50% or by modifying the dosing frequency and continue monitoring. Measure serum digoxin concentrations before initiating concomitant drugs. Reduce digoxin concentrations by decreasing the dose by approximately 15% - 30% or by modifying the dosing frequency and continue monitoring. Measure serum digoxin concentrations before initiating concomitant drugs. Continue monitoring and reduce digoxin dose as necessary. Measure serum digoxin concentrations before initiating concomitant drugs. Continue monitoring and increase digoxin dose by approximately 20 % to 40 % as necessary. A decline in GFR or tubular secretion, as from ACE inhibitors, angiotensin receptor blockers, nonsteroidal anti-inflammatory drugs [NSAIDS], COX-2 inhibitors may impair the excretion of digoxin. May cause sudden extrusion of potassium from muscle cells causing arrhythmias in patients taking digoxin. Endogenous substances of unknown composition (digoxin-like immunoreactive substances [DLIS]) can interfere with standard radioimmunoassays for digoxin. The interference most often causes results to be falsely positive or falsely elevated, but sometimes it causes results to be falsely reduced. Some assays are more subject to these failings than others. Several LC/MS/MS methods are available that may provide less susceptibility to DLIS interference. DLIS are present in up to half of all neonates and in varying percentages of pregnant women, patients with hypertrophic cardiomyopathy, patients with renal or hepatic dysfunction, and other patients who are volume-expanded for any reason. The measured levels of DLIS (as digoxin equivalents) are usually low (0.2 to 0.4 ng/mL), but sometimes they reach levels that would be considered therapeutic or even toxic. In some assays, spironolactone, canrenone, and potassium canrenoate may be falsely detected as digoxin, at levels up to 0.5 ng/mL. Some traditional Chinese and Ayurvedic medicine substances like Chan Su, Siberian Ginseng, Asian Ginseng, Ashwagandha or Dashen can cause similar interference. Digoxin requirements may increase during pregnancy and decrease in the postpartum period. Monitor serum digoxin levels during pregnancy and the postpartum period [see Dosage and Administration (2.5)]. Based on data from two lactation studies in a total of 13 breastfed infants, the digoxin concentrations in breast milk were between 0.4 – 1.0 ng/mL following 0.25 mg once daily dose of digoxin in the lactating mother. Thus, the amount of digoxin ingested daily by the infants is estimated to be between 0.03 to 0.16 μg/kg/day. This translates to a relative infant dose of digoxin between 1 to 7% of the maternal weight-adjusted dose and about 0.2 to 4% of the neonatal maintenance dose. The safety and effectiveness of digoxin in the control of ventricular rate in children with atrial fibrillation have not been established. The safety and effectiveness of digoxin in the treatment of heart failure in children have not been established in adequate and well-controlled studies. However, in published literature of children with heart failure of various etiologies (e.g., ventricular septal defects, anthracycline toxicity, patent ductus arteriosus), treatment with digoxin has been associated with improvements in hemodynamic parameters and in clinical signs and symptoms. The majority of clinical experience gained with digoxin has been in the elderly population. This experience has not identified differences in response or adverse effects between the elderly and younger patients. However, this drug is known to be substantially excreted by the kidney, and the risk of toxic reactions to this drug may be greater in patients with impaired renal function. Because elderly patients are more likely to have decreased renal function, care should be taken in dose selection, which should be based on renal function, and it may be useful to monitor renal function [see Dosage and Administration (2.1)]. The clearance of digoxin can be primarily correlated with the renal function as indicated by creatinine clearance. Tables 3 and 5 provide the usual daily maintenance dose requirements for digoxin based on creatinine clearance [see Dosage and Administration (2.3)]. The signs and symptoms of toxicity are generally similar to those described in the Adverse Reactions(6.1)but may be more frequent and can be more severe. Signs and symptoms of digoxin toxicity become more frequent with levels above 2 ng/mL. However, in deciding whether a patient’s symptoms are due to digoxin, the clinical state together with serum electrolyte levels and thyroid function are important factors [see Dosage and Administration (2)]. Adults: The most common signs and symptoms of digoxin toxicity are nausea, vomiting, anorexia, and fatigue that occur in 30 to 70% of patients who are overdosed. Extremely high serum concentrations produce hyperkalemia especially in patients with impaired renal function. Almost every type of cardiac arrhythmia has been associated with digoxin overdose and multiple rhythm disturbances in the same patient are common. Peak cardiac effects occur 3 to 6 hours following ingestion and may persist for 24 hours or longer. Arrhythmias that are considered more characteristic of digoxin toxicity are new-onset Mobitz type 1 A-V block, accelerated junctional rhythms, non-paroxysmal atrial tachycardia with A-V block, and bi-directional ventricular tachycardia. Cardiac arrest from asystole or ventricular fibrillation is usually fatal. Digoxin toxicity is related to serum concentration. As digoxin serum levels increase above 1.2 ng/mL, there is a potential for increase in adverse reactions. Furthermore, lower potassium levels increases the risk for adverse reactions. In adults with heart disease, clinical observations suggest that an overdose of digoxin of 10 to 15 mg results in death of half of patients. A dose above 25 mg ingested by an adult without heart disease appeared to be uniformly fatal if no Digoxin Immune Fab (DIGIBIND®, DIGIFAB®) was administered. Among the extra-cardiac manifestations, gastrointestinal symptoms (e.g., nausea, vomiting, anorexia) are very common (up to 80% incidence) and precede cardiac manifestations in approximately half of the patients in most literature reports. Neurologic manifestations (e.g., dizziness, various CNS disturbances), fatigue, and malaise are very common. Visual manifestations may also occur with aberration in color vision (predominance of yellow green) the most frequent. Neurological and visual symptoms may persist after other signs of toxicity have resolved. In chronic toxicity, non-specific extra-cardiac symptoms, such as malaise and weakness, may predominate. Children: In pediatric patients, signs and symptoms of toxicity can occur during or shortly after the dose of digoxin. Frequent non-cardiac effects are similar to those observed in adults although nausea and vomiting are not seen frequently in infants and small pediatric patients. Other reported manifestations of overdose are weight loss in older age groups, failure to thrive in infants, abdominal pain caused by mesenteric artery ischemia, drowsiness, and behavioral disturbances including psychotic episodes. Arrhythmias and combinations of arrhythmias that occur in adult patients can also occur in pediatric patients although sinus tachycardia, supraventricular tachycardia, and rapid atrial fibrillation are seen less frequently in pediatric patients. Pediatric patients are more likely to develop A-V conduction disturbances, or sinus bradycardia. Any arrhythmia in a child treated with digoxin should be considered related to digoxin until otherwise ruled out. In pediatric patients aged 1 to 3 years without heart disease, clinical observations suggest that an overdose of digoxin of 6 to 10 mg would result in death of half of the patients. In the same population, a dose above 10 mg resulted in death if no Digoxin Immune Fab were administered. If there is suspicion of toxicity, discontinue digoxin and place the patient on a cardiac monitor. Correct factors such as electrolyte abnormalities, thyroid dysfunction, and concomitant medications [see Dosage and Administration (2.5)]. Correct hypokalemia by administering potassium so that serum potassium is maintained between 4.0 and 5.5 mmol/L. Potassium is usually administered orally, but when correction of the arrhythmia is urgent and serum potassium concentration is low, potassium may be administered by the intravenous route. Monitor electrocardiogram for any evidence of potassium toxicity (e.g., peaking of T waves) and to observe the effect on the arrhythmia. Avoid potassium salts in patients with bradycardia or heart block. Symptomatic arrhythmias may be treated with Digoxin Immune Fab. Patients who have intentionally or accidently ingested massive doses of digoxin should receive activated charcoal orally or by nasogastric tube regardless of the time since ingestion since digoxin recirculates to the intestine by enterohepatic circulation. In addition to cardiac monitoring, temporarily discontinue digoxin until the adverse reaction resolves. Correct factors that may be contributing to the adverse reactions [see Warnings and Precautions (5)]. In particular, correct hypokalemia and hypomagnesemia. Digoxin is not effectively removed from the body by dialysis because of its large extravascular volume of distribution. Life threatening arrhythmias (ventricular tachycardia, ventricular fibrillation, high degree A-V block, bradyarrhythma, sinus arrest) or hyperkalemia requires administration of Digoxin Immune Fab. Digoxin Immune Fab has been shown to be 80-90% effective in reversing signs and symptoms of digoxin toxicity. Bradycardia and heart block caused by digoxin are parasympathetically mediated and respond to atropine. A temporary cardiac pacemaker may also be used. Ventricular arrhythmias may respond to lidocaine or phenytoin. When a large amount of digoxin has been ingested, especially in patients with impaired renal function, hyperkalemia may be present due to release of potassium from skeletal muscle. In this case, treatment with Digoxin Immune Fab is indicated; an initial treatment with glucose and insulin may be needed if the hyperkalemia is life-threatening. Once the adverse reaction has resolved, therapy with digoxin may be reinstituted following a careful reassessment of dose. Digoxin is one of the cardiac (or digitalis) glycosides, a closely related group of drugs having in common specific effects on the myocardium. These drugs are found in a number of plants. Digoxin is extracted from the leaves of Digitalis lanata. The term “digitalis” is used to designate the whole group of glycosides. The glycosides are composed of 2 portions: a sugar and a cardenolide (hence “glycosides”). Digoxin is supplied as 125 mcg (0.125 mg) or 250 mcg (0.25 mg) tablets for oral administration. Each tablet contains the labeled amount of digoxin USP and the following inactive ingredients: lactose monohydrate, hydroxypropyl methylcellulose, magnesium stearate. In addition, the dye used in the 0.125 mg tablets is D & C Yellow No. 10 aluminum lake. The times to onset of pharmacologic effect and to peak effect of preparations of digoxin are shown in Table 7. Hemodynamic Effects: Short-and long-term therapy with the drug increases cardiac output and lowers pulmonary artery pressure, pulmonary capillary wedge pressure, and systemic vascular resistance in patients with heart failure. These hemodynamic effects are accompanied by an increase in the left ventricular ejection fraction and a decrease in end-systolic and end-diastolic dimensions. ECG Changes: The use of therapeutic doses of digoxin may cause prolongation of the PR interval and depression of the ST segment on the electrocardiogram. Digoxin tablets may produce false positive ST-T changes on the electrocardiogram during exercise testing. These electrophysiologic effects are not indicative of toxicity. Digoxin does not significantly reduce heart rate during exercise. Absorption: Following oral administration, peak serum concentrations of digoxin occur at 1 to 3 hours. Absorption of digoxin from digoxin tablets has been demonstrated to be 60% to 80% complete compared to an identical intravenous dose of digoxin (absolute bioavailability). When digoxin tablets are taken after meals, the rate of absorption is slowed, but the total amount of digoxin absorbed is usually unchanged. When taken with meals high in bran fiber, however, the amount absorbed from an oral dose may be reduced. Comparisons of the systemic availability and equivalent doses for oral preparations of digoxin are shown in Dosage and Administration (2.6). Digoxin is a substrate for P-glycoprotein. As an efflux protein on the apical membrane of enterocytes, P-glycoprotein may limit the absorption of digoxin. In some patients, orally administered digoxin is converted to inactive reduction products (e.g., dihydrodigoxin) by colonic bacteria in the gut. Data suggest that 1 in 10 patients treated with digoxin tablets, colonic bacteria will degrade 40% or more of the ingested dose. As a result, certain antibiotics may increase the absorption of digoxin in such patients. Although inactivation of these bacteria by antibiotics is rapid, the serum digoxin concentration will rise at a rate consistent with the elimination half-life of digoxin. Serum digoxin concentration relates to the extent of bacterial inactivation, and may be as much as doubled in some cases [see Drug Interactions (7.2)]. Patients with malabsorption syndromes (e.g., short bowel syndrome, celiac sprue, jejunoileal bypass) may have a reduced ability to absorb orally administered digoxin. Distribution: Following drug administration, a 6 to 8 hour tissue distribution phase is observed. This is followed by a much more gradual decline in the serum concentration of the drug, which is dependent on the elimination of digoxin from the body. The peak height and slope of the early portion (absorption/distribution phases) of the serum concentration-time curve are dependent upon the route of administration and the absorption characteristics of the formulation. Clinical evidence indicates that the early high serum concentrations do not reflect the concentration of digoxin at its site of action, but that with chronic use, the steady-state post-distribution serum concentrations are in equilibrium with tissue concentrations and correlate with pharmacologic effects. In individual patients, these post-distribution serum concentrations may be useful in evaluating therapeutic and toxic effects [see Dosage and Administration (2.1)]. Digoxin is concentrated in tissues and therefore has a large apparent volume of distribution (approximately 475 to 500L). Digoxin crosses both the blood-brain barrier and the placenta. At delivery, the serum digoxin concentration in the newborn is similar to the serum concentration in the mother. Approximately 25% of digoxin in the plasma is bound to protein. Serum digoxin concentrations are not significantly altered by large changes in fat tissue weight, so that its distribution space correlates best with lean (i.e., ideal) body weight, not total body weight. Excretion: Elimination of digoxin follows first-order kinetics (that is, the quantity of digoxin eliminated at any time is proportional to the total body content). Following intravenous administration to healthy volunteers, 50% to 70% of a digoxin dose is excreted unchanged in the urine. Renal excretion of digoxin is proportional to creatinine clearance and is largely independent of urine flow. In healthy volunteers with normal renal function, digoxin has a half-life of 1.5 to 2 days. The half-life in anuric patients is prolonged to 3.5 to 5 days. Digoxin is not effectively removed from the body by dialysis, exchange transfusion, or during cardiopulmonary bypass because most of the drug is bound to extravascular tissues. Special Populations: Geriatrics: Because of age-related declines in renal function, elderly patients would be expected to eliminate digoxin more slowly than younger subjects. Elderly patients may also exhibit a lower volume of distribution of digoxin due to age-related loss of lean muscle mass. Thus, the dosage of digoxin should be carefully selected and monitored in elderly patients [see Use in Specific Populations (8.5)]. 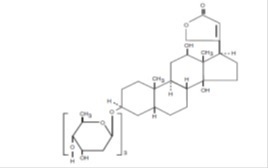 Two 12-week, double-blind, placebo-controlled studies enrolled 178 (RADIANCE trial) and 88 (PROVED trial) adult patients with NYHA Class II or III heart failure previously treated with oral digoxin, a diuretic, and an ACE inhibitor (RADIANCE only) and randomized them to placebo or treatment with digoxin tablets. Both trials demonstrated better preservation of exercise capacity in patients randomized to digoxin tablets. Continued treatment with digoxin reduced the risk of developing worsening heart failure, as evidenced by heart failure-related hospitalizations and emergency care and the need for concomitant heart failure therapy. The Digitalis Investigation Group (DIG) main trial was a 37-week, multicenter, randomized, double-blind mortality study comparing digoxin to placebo in 6800 adult patients with heart failure and left ventricular ejection fraction less than or equal to 0.45. At randomization, 67% were NYHA class I or II, 71% had heart failure of ischemic etiology, 44% had been receiving digoxin, and most were receiving a concomitant ACE inhibitor (94%) and diuretics (82%). As in the smaller trials described above, patients who had been receiving open-label digoxin were withdrawn from this treatment before randomization. Randomization to digoxin was again associated with a significant reduction in the incidence of hospitalization, whether scored as number of hospitalizations for heart failure (relative risk 75%), risk of having at least one such hospitalization during the trial (RR 72%), or number of hospitalizations for any cause (RR 94%). On the other hand, randomization to digoxin had no apparent effect on mortality (RR 99%, with confidence limits of 91 to 107%). Digoxin Tablets USP, 125 micrograms (0.125 mg): Bottles of 100 with child-resistant cap (NDC 57664-437-88) and 1000 (NDC 57664-437-18). Round, biconvex, yellow tablets, debossed with "437" on one side and scored on other side. Digoxin Tablets USP, 250 micrograms (0.25 mg): Bottles of 100 with child-resistant cap (NDC 57664-441-88) and 1000 (NDC 57664-441-18). Round, biconvex, white tablets, debossed with "441" on one side and scored on other side. Store at 25°C (77°F); excursions permitted to 15° to 30°C (59° to 86°F) [See USP Controlled Room Temperature] in a dry place and protect from light. Keep out of reach of children. Dispense in tight, light-resistant container. Advise patients that many drugs can interact with digoxin. Instruct patients to inform their doctor and pharmacist if they are taking any over the counter medications, including herbal medication, or are started on a new prescription. Advise patients to contact their doctor or a health care professional if they experience nausea, vomiting, persistent diarrhea, confusion, weakness, or visual disturbances (including blurred vision, green-yellow color disturbances, halo effect) as these could be signs that the dose of digoxin may be too high. Advise parents or caregivers that the symptoms of having too high digoxin doses may be difficult to recognize in infants and pediatric patients. Symptoms such as weight loss, failure to thrive in infants, abdominal pain, and behavioral disturbances may be indications of digoxin toxicity.